I’ve used a couple different lenses in my day, but I keep finding myself coming back to my beloved 50mm f/1.8 lens. It’s the lens I used to take pictures of my girls when they were infants so that I could eschew the flash. It’s the lens I use at concerts if I can get close enough to the stage. 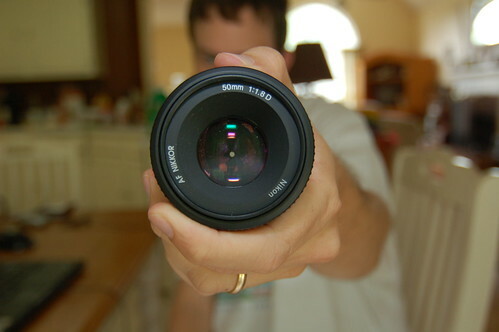 It’s the lens I use for nice blurry backgrounds. I’m amazed that it’s such a versatile and powerful lens for such a cheap pricetag. I’m of the opinion that everyone with an SLR should own one of these, especially if you don’t have a full-frame sensor, be it Nikon or Canon. At some point, I may break down and get the 35mm f/1.8 DX which seems like it would be easier to use in crowded indoor situations where I can’t back up enough, but for now, this little guy goes with me just about everywhere I go with my camera, even if I have another lens mounted. Flickrites call the obsession with this lens “Fiddy Love.” Love my Fiddy.